The Government has unveiled a brand new breakfast cereal to help boost optimism about the prospect of the UK leaving the EU – ‘Brexit’. Brexit will be on the shelves on Monday, to coincide with the majority of students in Scotland returning to university who need “affordable and patriotic food to start their day”. A Government spokesperson said: “Brexit is a brand new cereal product, that can be had with hot or cold milk, but it must be British milk, else the cereal turns purple and poisonous. Previews of the new product have shown each cereal piece resembling the head of a loyal Brexit campaigner, and other symbols of British patriotism. Characters set to feature inside the cereal box are Liam Fox, Boris Johnson, Michael Gove and John Cleese. The packaging will display no allergen information, in the spirit of “adventure and excitement about the unknown”, said the PM. The only difference in the range of products made under the Brexit banner will be a box containing only Andrea Leadsom faces, which is gluten-free because mothers know best. 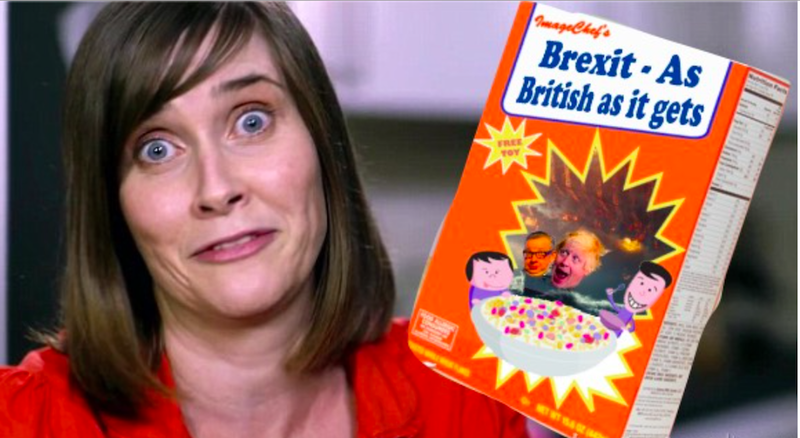 May also announced the new cereal will be advertised throughout the airwaves shortly, with the Patronising BT Lady becoming the face of the new product. The Daily Belter tracked down Patronising BT Lady to ask her about her new role. DB: So, Patronising BT Lady, are you excited about the new part you will be playing with Brexit? PBTL: Absolutely! The Better Together advert was obviously a little underwhelming in its reception. I received a lot of negative feedback on it, but I feel it got the message across well. DB: How will your performance differ from the Better Together advert? PBTL: Well – I cannot give too much away – the setting is different: I am going to be acting as a teacher, and the ad will open with me teaching a class how to spell Brexit, and that Brexit means Brexit. It will then cover things like “Brexit is good for your brain”, that sort of thing. DB: What about the “eat your cereal” comment that so angered many? PBTL: Well, we realised that it was a major point of contention. Instead we will switch it to the line “eat your Brexit”, which is a nice product drop, but also doesn’t lose the spirit of the message. DB: Don’t you think that is a little… patronising? PBTL: My name is Patronising, remember. DB: Ah, yes. Thank you for your time, Ma’am. Good luck with the new career. The manufacturers have hinted there will be goodies inside some boxes, but that a guarantee for EU nationals will not feature in these free giveaways.